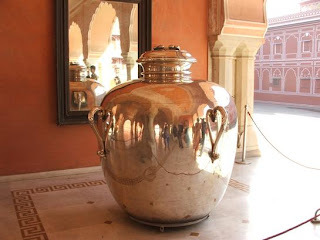 One of two silver water pots in City Palace, Jaipur, India. My little 5-year-old desktop keeps complaining about low disk space the rate at which I've been adding digital photos. It has enough disk space, D insists. But how much is enough, really? Anyway, in an attempt to "clean-up" my junk from the desktop, I was sorting through my photos and came across some that I had almost forgotten about: photos from our trip to India last year. It has been a year since we took that vacation. I am longing for another trip. There are so many corners of India we have not explored yet. But, we want to go somewhere we've never been to before. I am not sure we can afford it; but, I am definitely getting the itch to travel again... to get away.